In sometimes quiet and subtle ways, Nintendo has been expanding its presence in the Korean market ever since opening a new division of the company in Seoul back in 2006 and enthralling Korean gamers with many of its major software releases. In the case of Animal Crossing: New Leaf, the game saw the light of day in Korea even before Westerners had a chance to get their hands on it. Now, Capcom is following suit with its most wildly successful title in years, Monster Hunter 4. The company has announced that the game was recently translated into Korean and is scheduled to launch in that region on December 14th. In addition, Monster Hunter 4 will feature prominently at G-Star, Korea's largest gaming expo, which takes place over the next few days — from 14th to 16th November, to be exact. The release of Monster Hunter 4 is sure to increase Nintendo's stronghold in Korea, as the title sold 3 million copies only a month after its initial Japanese launch. Nintendo's long-standing establishment in South Korea seems to have allowed them to facilitate recent Korean releases by their third-party companies, as they also assisted Atlus in importing Shin Megami Tensei IV and Etrian Odyssey IV to Korean shores. The enormous phenomenon of Monster Hunter 4 in Japan propelled the Monster Hunter series toward becoming one of the best-selling brands in Capcom's history. 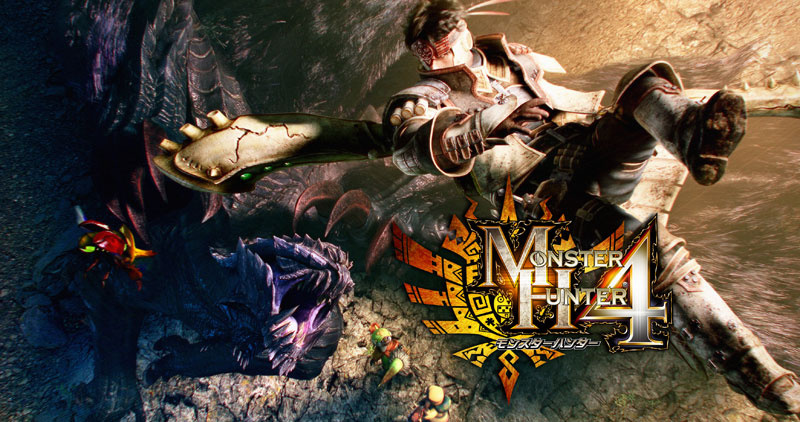 Though the title would also be a sure-fire hit in Europe and North America, the gaming world still awaits an official announcement from Capcom on the release of Monster Hunter 4 in those regions. Whenever your ready Capcom so are we. @CaviarMeths Welcome to Nintendo Life. A western release is assured we just need a date. I hope they are doing a Wii U version as well. Oh and real online this time around would be perfect. @CaviarMeths Haha, it made me get a wee bit excited too, but would be too early to announce it for EU/US. Hope it doesn't come here, or it will be like Tri again where my social life disappears lol. Sees title OH MY GOD! sees next line...... BLANK! Oh well any venture outside Japan is a good start. It's gonna be coming here!!!!!!! Here's hoping a western release is announced in today's Nintendo Direct. Please! @Ecto-1 Isn't the Nintendo Direct about previously announced 3DS games? Anyway, here's a bit of a word to those getting angry/sad about not having a MH4 release date (only a little more than half a year after getting the giant behemoth of a game that is MH3G/3U), unlike a western release, a release in South Korea isn't a sure thing. Got all excited for nothing. Thank you NL... day ruined. My great sword is ready. A Western release next Spring would be very nice. @Tsuchinoko Yes but there isn't all that much to talk about. Plus when Nintendo says is about previously announced games they always throw a surprise or 3 in there. The announcement of this localized wouldn't surprise me at all! Now a date is another story all together. I just picked up the Goa Magara 3DS LL, and I can say so far that the game is fantastic. I really hope it gets localized. @Spoony_Tech I guess I can see that point, I just wish people weren't such drama queens though. Now something like the Bravely Default or the Etrian Odyssey IV announcement were on much less stable ground, but people have to trust that Nintendo has their back with the MH series, since all of the games that appeared on Nintendo consoles have gotten released in the west. The release in South Korea is a pretty big thing though, as there are many fans of the MH series in that country, but console game releases are really inconsistent. @DavidHolliss That is the estimated release window, even though its extremely wide and unofficial. I actually didn't catch that missed the bit about the direct focusing on previously announced titles. Still, stranger things have happened. LUCKY THEM! does give hope for western release. That was a cruelly misleading article title. I nearly inhaled my water. Its still possible Nintendo might mention a Western release during Nintendo Direct, I'll keep my sword sheathed till then. What would a set of Nintendo Life armor look like? I don't know. As fun as MH3U was, it was immersion breaking in some spots. I hated the idea I had to go into a lobby to find a party and being closed off from the whole community minus these 3 other players. If they would create monster hunter game where it's open world and see other players all around you at all times when you are in the towns, to where you can create groups just by sending out an LFG message and then traveling with your group through the terrain of the game to get to your destination to kill the monster, kind of how like WoW works, Monster Hunter would be my favorite series, even replace WoW for me. But the whole lobby system just kills it. It would be awesome to have a barter system in the game so you can buy and trade with other players at the towns. @Element187 im assuming thats how the pc version MH Frontier played. This is good news. I now feel that there is a good chance this will be translated and released in Western Regions of the world. Outside of Japan... My heart started beating faster. In Korea... My heart skipped a few beats. What is going on? Oh wait, Capcom, are we not begging enough? DAMMIT! I got all excited too soon. ...that said, MH3 I think looks better. MH4 looks really over-saturated and the polys are so much more obvious than in MH3 (from the videos). @Christopher I don't know if anyone cares about this, but here's a link to the South Korean Nintendo Direct. The presenter is named Hiroyuki Fukuda, and his Korean sounds really good, though I do hear a bit of a Japanese accent so I'm guessing he's not a Japanese Korean. And Tsujimoto even speaks a bit of Korean too! Though they go right to Japanese with Korean subs after. Capcom, come see me in 2014. OK? Okay Capcom this is your chance to make-up for the lack of new Mega Man games for 3DS. if monster hunter 4 does not get released before the end of next year ,im selling my DS an will never play MH again. like wthell?!why? !you telling me translating this game to english cos trillions of dollars? !seriously like why?! Glad for them. Now if Capcom would announce it for everywhere else then we could all party.